Using computer software technology to improve business success isn’t without pain, but few worthwhile things are without pain. Every time I’ve decided to improve my physical fitness, whether it was walking, jogging, lifting weights, or swimming, there were times in the next few months that I just knew I’d made the wrong decision. When my muscles ached in the morning, asking me, “Why did you do that to us again?” I knew that pain makes gain. So I truly believe that every business can be more successful. Define success as you will: more profit, fewer hours, more customers, more satisfied customers, etc. Now here’s the big thing: Even though every business can be more successful, what I personally do can’t necessarily make your particular business more successful. As much as I like doctors, I don’t need an OB/GYN. I just don’t have the right parts. My wife, on the other hand, got much benefit from the help they provide (we also got a few kids in the bargain). The one thing I’ve believed all along is that when I can’t help someone, I tell them. We’re going to expand that into a more significant statement in the new year. Until now, think about how you might make your business more successful. I believe every business can be more successful…with less work. Many of the clients we work with are the proud owners of dying systems. Dying, I say, because they are 15+ year old and the person or company who created them are (sometimes literally) dying. Old versions of Unix, AIX and XENIX, and the hundred different operating systems and software packages that sprang to life in the “early days” of accounting software are on the way out. P eople I talk to can’t believe that Peachtree software used to be a full-fledged modular accounting software package. We recommended it to clients at $495 per module, with a single user. You can buy Peachtree 2012 from CDW (www.cdw.com) for $1104.99 for 5 users. It includes everything you’d need to run a small, simple business. In the days when Peachtree General Ledger sold for $495, accounting software was just for accounting. Accounting software today is usually called ERP software. Today, the emphasis is on using the software to improve margin, increase efficiency, serve customers better, and grow sales. 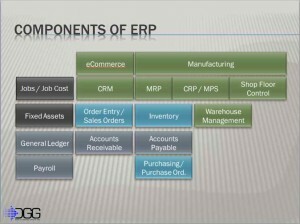 To get the most out of ERP software, software today is being implemented with a view to the ROI of the system. Metrics are used to guarantee that the system improves the bottom line. Software today implements business processes and provides many opportunities for improving the bottom line. Our specialty is helping clients save money and grow sales by using their ERP and accounting software better. More information about ERP software and accounting software is available on our web site. For some time now, we’ve anticipated the release of MS Dynamics NAV 2012. Microsoft announced earlier in the year that it will likely ship in the 4th Quarter of 2012. One new development is that it will run completely inside a browser (IE 9). This will make it easy to run both on premise and over the Internet / Intranet. 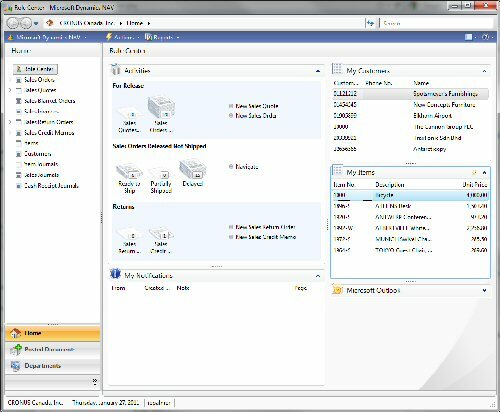 Other developments in NAV 2012 include an improved report writer (haven’t been able to see it yet, but any improvements to reporting will help our clients), and “forms” are eliminated. This basically means that the new interface (Role Tailored) will be the only interface. That’s not a bad thing. The more I work with it, the better I like it. According to the latest word from inside Sage, the release of its ACCPAC ERP software version 6.1 has been delayed until at least the middle of next year, most likely June. We expected it. This version is an ambitious (and very good for ACCPAC users) upgrade in plumbing. It’s the right thing for Sage to delay it until it’s right. Preliminary looks are very promising, both in terms of the out-of-the-box experience and the customization possibility. Our website has more information about Sage ERP ACCPAC implementation and support. A quick YouTube Demo of the new look and feel was in a prior post.